How was your weekend? I spent the weekend in Dallas celebrating the wedding of one of my oldest friends. It was such a wonderful weekend and I'll have a recap soon, but today I want to talk about pizza. As in PIZZA! We eat a lot of pizza around here. We have a great spot down the block from us who we order from more often than I'd like to admit. I also make my own pizza a lot, and typically have a store-bought dough in my fridge at any given time for a quick and absolutely delicious Friday night dinner. I've been making a lot of cauliflower pizza recently which feels oh-so-decadent while on Dukan. So many options, but lately I've been wanting to change it up a bit. Enter the taco pizza. 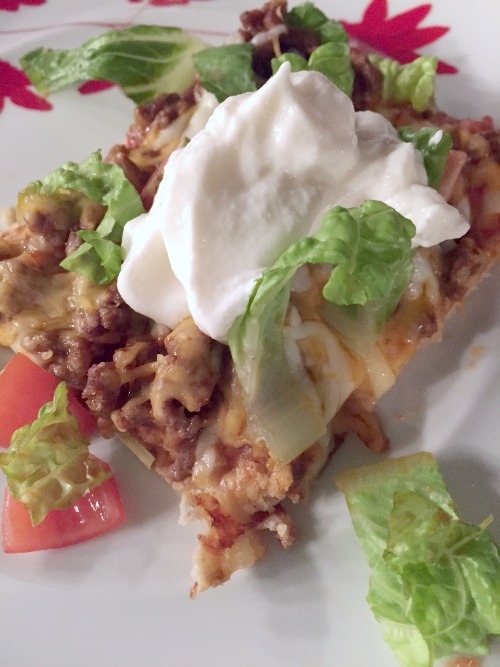 Secret Recipe Club came at a great time because I was on the hunt to change up our repetoire, and low and behold, I stumbled on Heather's recipe for taco pizza. 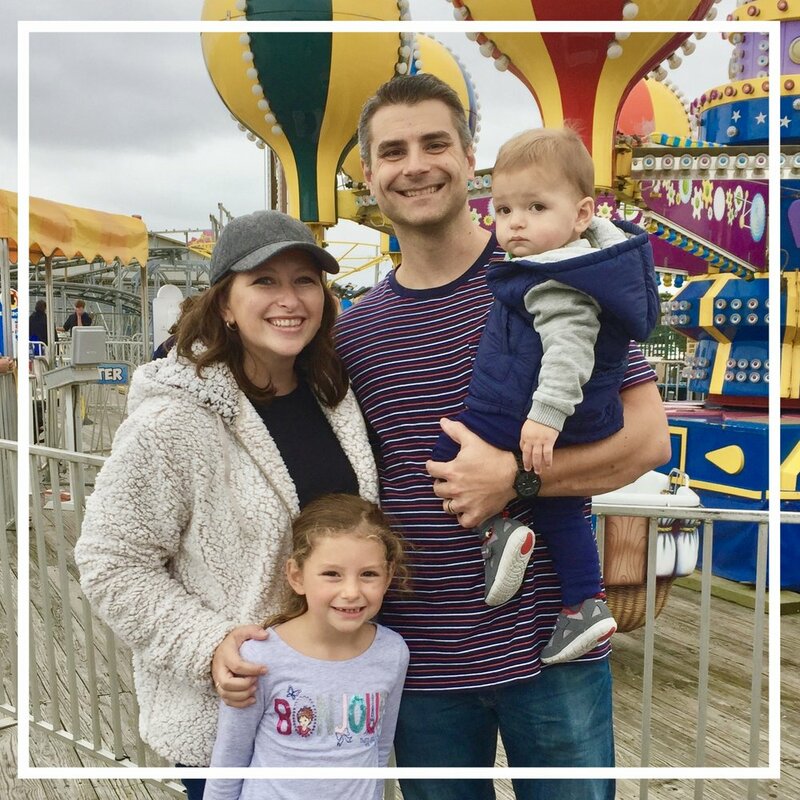 Heather blogs about all kinds of amazing recipes that her kids love and say they are 'yummy to my tummy' --->so adorable! Featured on her blog, It's Yummy to my Tummy, Heather made a pizza crust from scratch for this and though I've been wanting to try that (I even bought active dry yeast, but am too scared to use it), I decided to make the taco pizza on a cauliflower crust in the interest of keeping it Dukan-friendly. The result was nothing short of AWESOME. Even Shaun really enjoyed it and I know he kindly goes along with my cauliflower pizza though he would never choose that over the real deal if I wasn't pushing it on him. I think we both agreed that this guiltlessly elevated our weekday pizza night and this will now be a staple in our repetoire! Have your pizza crust cooked and prepared on a baking sheet. Preheat oven to 425 degrees. In a skillet, brown the beef or turkey and then mix in the taco seasoning and water. Simmer, stirring occasionally, until much of the liquid has burned off. Meanwhile, pour sauce all over your prepared crust. Top with 2/3 taco meat, spreading it all over the top of the sauce. Sprinkle cheese on top. Place in oven until the cheese is melted, about 10-12 minutes. Remove from oven and top with shredded lettuce, diced tomatoes and Greek yogurt, if desired. Using a pizza cutter, cut into squares or slices and serve immediately! Thanks to Heather for this super delicious and very filling dinner! We also had leftovers, which almost never happens with cauliflower pizza since it's so thin. By tacoifying the pizza, we made it stretch a lot farther!